LOUNGE/DINER: 16' 11" x 15' 5" (5.18m x 4.70m max) Rear aspect double glazed patio doors to garden room, rear aspect double glazed window, wood effect laminate flooring, wall mounted radiator, television point, door to kitchen. WC: Rear aspect double glazed obscure window, tiled floor, tiled walls, wash hand basin with vanity unit, low level WC. GARDEN ROOM: 9' 9" x 9' 6" (2.98m x 2.91m) Rear aspect double glazed double doors to garden, two rear aspect and one side aspect windows, tiled floor, unheated. REAR PORCH/WORKSHOP 8' 2" x 6' 5" (2.50m x 1.96m) Rear aspect double glazed door, rear aspect double glazed window, power. 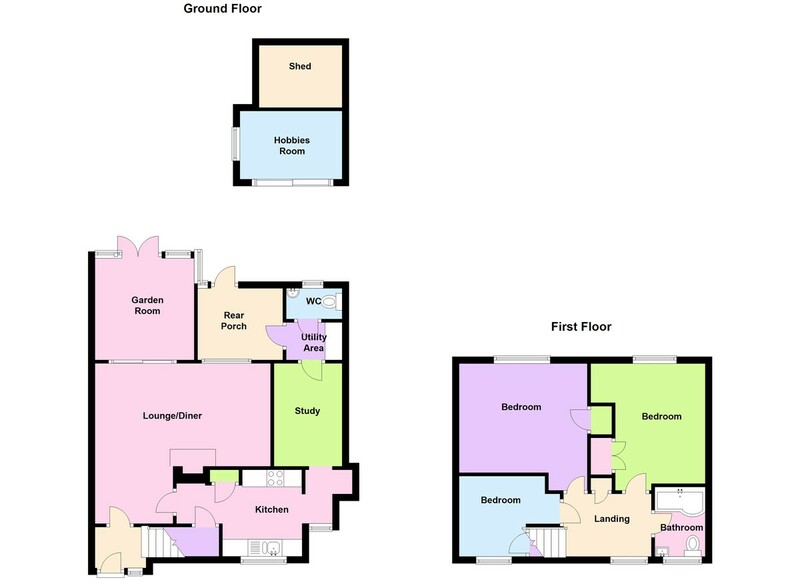 1ST FLOOR LANDING: Front aspect double glazed window, airing cupboard housing wall mounted boiler, door to all rooms. BEDROOM ONE: 12' 4" x 10' 5" (3.76m x 3.20m max) Rear aspect double glazed window, wall mounted radiator, built in cupboard. BEDROOM TWO: 11' 6" x 11' 0" (3.52m x 3.36m max) Rear aspect double glazed window, wall mounted radiator, built in cupboard. BEDROOM THREE: 9' 8" x 7' 8" (2.96m x 2.36m max) Front aspect double glazed window, wall mounted radiator, built in cupboard, loft access. BATHROOM: 6' 8" x 5' 5" (2.04m x 1.66m) Front aspect double glazed obscure window, fully tiled, chrome towel radiator, curved bath with shower over and glass screen, wash hand basin and vanity unit, low level WC. OUTSIDE FRONT: Walled front, shared path to front door, side acces to rear, laid to lawn, shrubs and tree. OUTSIDE REAR: Fully enclosed, access at side to front, patio, mature shrubs and bushes, covered seating area, artificial lawn, shed. HOBBIES ROOM: Double glazed patio doors, side aspect double glazed window.